With vast areas of land in the Talladega National Forest there is plenty of deer hunting action. When the topic of hunting public land arises, many deer hunters just shake their heads. Their comments can range from “it’s too crowded,” to “there aren’t any bucks”. This could be true for some sections of public land, but there are some exceptions. In the east-central sections of the Cotton State, the Talladega National Forest (TNF) covers over 392,000 acres. The forest is a mix of hardwoods and second-generation growth of pines. The forest was over-harvested for timber before it was purchased by the U.S. Government in the 1930s. The U.S. Forest Service (USFS) manages the land and the Alabama Department of Natural Resources manages the wildlife. The partnership of the two entities has resulted in a balanced ecosystem. There is a tremendous amount of outdoor recreation opportunities in the Talladega National Forest, including deer hunting. In the early years of the National Forest system, the forests were managed for timber production. But, around 1990 the public wanted a different management plan for the NF system for all uses. In the early 1990s, the USFS began to manage for wildlife habitat. 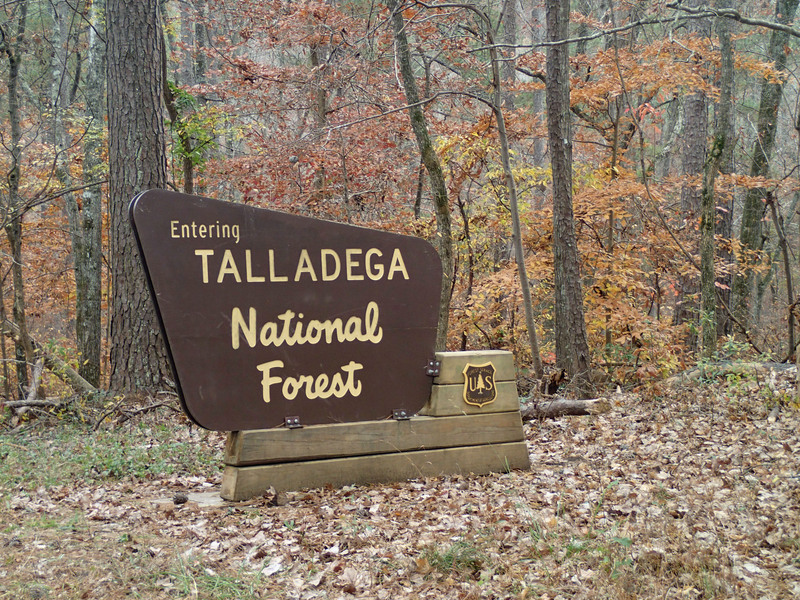 The Talladega National Forest is set up in three districts, Talladega, Shoal Creek, and Okmulgee. Each district is intrinsically the same with a few differences, mainly in terrain. Habitat is mixed pines and hardwoods. Mature pines vary from longleaf to loblolly depending on the district area. Since the TNF covers hundreds of thousands of acres, the first step in locating a hunting spot is to acquire a map. Forest Service maps are available at any of the district ranger offices for a small fee. Also, MyTopo.com can provide a topographical map with the TNF boundaries shown. The USFS offers a mobile app that can access information to all the National Forests in Alabama. With the app users can gain information on activities, recreation sites, alerts and safety messages and road closures. There are hundreds of miles of roads throughout the TNF. Most of these roads are improved dirt with gravel. A majority are drivable with any type of vehicle. However, during the winters months, there can be some spots along the roads that become muddy. A type of feature that deer hunters should focus their attention first is the numerous creeks and branches located throughout the Talladega National Forest. Along these tributaries are food sources for deer and other wildlife. Mast crops like acorns along with various herbaceous plants are common in hollow bottoms. The open areas of the pine ridges allow for more sunlight to reach the forest floor. With the additional light a variety of plants see new growth. This additional forage provides food for deer and other wildlife year-round. Deer hunters can scout the ridges for sign and a place to set a stand. With the Shoal Creek and Talladega Ranger Districts lying at the Southern end of the Appalachian Mountain range, there can be some steep ridges and deep hollows. South of Heflin, Ala. is Mt. Cheaha, the state’s highest point. And the terrain is steep. However, the hills and ridges do flatten out north and south of Cheaha Mountain. Deer season runs through February 10, except in the wildlife management areas. 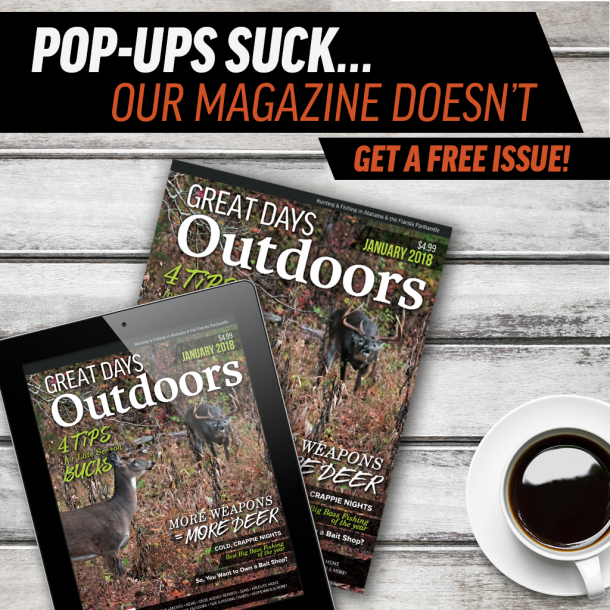 The WMAs have special seasons and deer hunters can take advantage of those dates. Hunters should consult the Alabama Hunting and Fishing Digest and the WMA schedule for exact hunting dates. 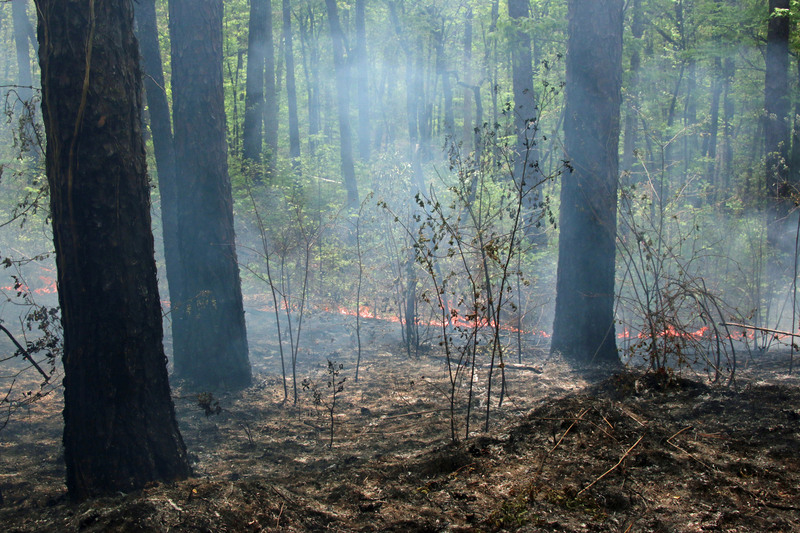 Over the years, part of land management in the Talladega National Forest has been controlled burns. Certain sections of land in different regions are burned on a rotational basis. Each district performs their controlled fires in late winter to early spring. Burn sections usually range from a few hundred acres to a couple of thousand, depending on the area and terrain. The reasons for the control burning process is two-fold. The controlled fire consumes ground litter and dead brush that can build up over time. If a wildfire were to start, the excess fuel on the forest floor can cause the fire to burn hotter and destroy trees. The control burns also improve the forest habitat allowing more native plants to be established providing food for wildlife. There are two seasons for control burning used by rangers in the TNF. The dormant burn season is when the trees and understory are dormant in the winter months. The growing season burn is when the plants and trees begin to grow and put on leaves as the weather warms during the spring. Some burn rotations are done as dormant burns then later as growing season burns. The cycle is on a three to five-year spacing. Some areas in the TNF are on a two-year cycle which can further enhance the habitat. Since the control burns allow more sunlight to reach the ground, the plant species become more diverse. These burned areas are top locations for deer hunters. Food is one of the main driving forces for white-tailed deer. These selectively torched areas provide plant diversity that deer prefer. Also, the understory is more open allowing hunters longer views and easier walking. Timber sales are one part of the operation of the NF. Each year certain areas are logged and replanted with pine seedlings. Many hunters may drive past these areas thinking the deer have moved on. However, it’s just the opposite. The timber cutting operation disturbs the soil and opens the forest floor to abundant sunlight. Because of this process, plant forage begins to thrive, and deer can easily find plenty to eat. After a couple of growing seasons, these cut-over areas not only provide food but also cover. The logged areas adjacent to other pine and hardwood stands creates an abundance of edge habitat deer love. One key to hunting public land is avoiding areas frequented by other hunters. Many hunters will opt for the easiest way in and out of an area. Also, most hunters on NF lands will not venture far off a road. Savvy deer hunters will seek out areas on the TNF where very few hunters visit. This is not difficult given the expanse of the TNF. Some roads in the Talladega National Forest may be closed or gated off to vehicles. However, foot travel is invited and a short hike behind the gate can lead to a great hunting location. Remember, do not block any gate on the NF. Some of the roads are used as fire breaks for the controlled burns. He says some folks call these “dim” roads. They haven’t been driven down in years, but are fairly easy to walk. Deer will often use these old roads as trails. They leave scrapes, rubs and other sign indicating this is part of their range. Sometimes it may take some extra footwork to reach a prime area. These are areas hunters and people seldom visit. Wilderness areas are designated as such, that no vehicles or machinery are allowed inside. Even the USFS is not allowed to take in vehicles to battle wildfires in wilderness areas. They must do it on foot. There are two wilderness areas with the Talladega National Forest. The Cheaha Wilderness Area in the Talladega District and Dugger Mountain in the Shoal Creek District near Piedmont. Ala. These areas are foot travel only. Hunters will need to be well prepared for hunting these locations. The extra effort can pay off for deer hunters as the wilderness areas are rarely disturbed by human contact. Expect some longer walks in to get back into some prime hunting areas. There is an abundance of beauty, wildlife, and deer in the Talladega National Forest. The mix of pines and hardwoods along the with mountain tops touching the sky makes it a perfect place for a great day outdoors. 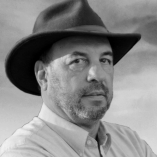 Charles Johnson writes about all things outdoors for Great Days Outdoors. He will outrun a bear for a biscuit and gravy. Nice read. Though I am in a private lease in SE Alabama and already purchased a non resident hunting license, With this information I will seriously consider tying the TNF.